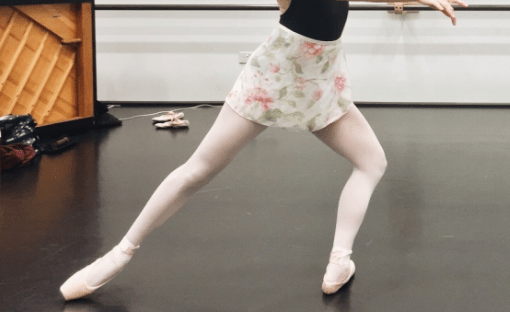 A recent habit I’ve been trying to acquire is to lengthen and fully straighten both my legs during a tendu, jete, fondu (or rather, coming up from a fondu), grand battement… and pretty much all the time during ballet class. A fully lengthened leg looks beautifully straight. When I say, a straightened-leg … I’m referring to ballet standards here. Most non-dancers will agree that your leg is straight, when you’re standing or if you happened to lift one leg off the ground to show it to them. But that is not considered straight in ballet. In ballet, a straightened leg requires strength and engagement from your leg muscles. It also looks very different. Interestingly, a straight-looking (ballet) leg looks effortless. But unfortunately, the opposite is actually true. A straight looking leg has energy flowing through it and the muscles are fully engaged. It is just that in ballet, we use our muscles differently from body builders and weight lifters. We don’t grip the muscles, but we stretch them so that they look long and become lean. Thus, we don’t develop bulky muscles the way they do (of course, generally speaking. The way your muscles develop also depends on a number of factors such as muscle type, body type). A less-than-straight leg, according to ballet standards, looks lazy. And that pretty much comprises the whole adult ballet dancer population, unless, they are very fortunate to have a good teacher who looks beyond their adult body and trains them like they do to the pre-professionals. But in all honesty, I know the sincere, hard-working adult dancer is FAR from being lazy. They just haven’t developed that sensitivity yet. But, we have to acknowledge the fact that it looks lazy, no matter how hard you think you’re working. It is just the matter of unlocking those ‘sleeping muscles’. For years, I wondered exasperated why my teachers kept telling me the same thing. “To straighten my leg”. But…ISN’T MY LEG ALREADY STRAIGHT???? I also wondered why some of my friends (a very few of them, I’ll admit) never get told to straighten their legs. Okay, so the raw fact is that it is largely due to the shape of their legs. Those gifted straight legs or certain hyper-extensions – those legs look straight no matter what they do, whether or not they are using the correct muscles. Regardless of whether you’re of that gifted breed, the correct ballet technique to lengthen and straighten our legs, with muscles fully engaged. Even if you get away without mastering this technique, you won’t be able to advance properly. So sorry, you still have to work hard like the rest of us. Beginner dancers and non-dancers will not realize the extent to what I mean by ‘fully-engaged’. It will take some time to develop the sensation and the know to whether their leg is straight enough (with a fully pointed foot). Thus, I have labeled this post under advanced. Being able to dance ballet with fully lengthened legs is, in my opinion, one of the hardest things to achieve for an adult dancer. We don’t have the luxury of slow-learning. We are not okay with waiting for a decade for our muscles to instill that habit. Many adult ballet dancers dance with loose legs. Thus, we should always be conscious of this. We must think of pulling up the knees, stretching the back of the knees, and sending energy through the whole leg and shooting that energy from our toes out the door. When we tendu, we have to think of going under the floor (a tip I received from David Howard through one of his books). We have to apply pressure to the floor even when we’re standing in 5th position. This will get the legs to engage the muscles and hopefully, it becomes a habit quicker than expected. The worst offender is the back leg. This is especially so in a degage derriere a terre or en lair (when your leg is behind you on the floor or in the air). The easiest to spot the loose back leg, especially, if you’re dancing in adult ballet class or open classes… is the position of the arabesque. Somehow, the back leg never fully straightens for most adult dancers. Try to look out for it when you’re in class tonight. This is not meant to judge other people’s dancing, but being more conscious of this will increase awareness in your own dancing, so that you can improve. Adult dancers, including myself, tend to ‘forget’ the back leg, because we mostly can’t see it in the mirror. I wrote about ballet eyes, and how it takes time to develop its sharpness. We also haven’t developed the sensitivity in our body. In other words, we can’t FEEL our back leg. We think we can, but we can’t feel it to that degree to control it automatically, thus, for now, we have to consciously think about it. We have to rely on mental strength to memorize this, think about it and actively act on it. There are a few ways I do this. I haven’t successfully gotten this into a habit (yet). When my leg is going to the back, I think about the area of the back of my knee. My teacher sometimes scratches it, so that I’m more conscious of it. Thus, I try to recreate that feeling in my mind. I sometimes pull up a mental image of my back knee. Other times, I think about both my legs growing longer. I stand taller on the supporting leg and the working leg just reaches as far back as I can, as though I have to try to touch the wall with it. I will have to warn you. It is not easy and it requires A LOT more effort than what you’ve been regularly doing. Most adult dancers, never fully straighten their leg, even when posing for ballet photos. There are some very talented dancers with beautiful bodies, such as beautifully arched feet and hyperextension in their legs (considered to be beautiful in ballet). Unfortunately, because they don’t fully straighten their legs in the ballet way, their ballet pictures or dancing is not quite up to their potential. I’m only slightly hyper-extended, and so my ballet teacher wants me to maximize the “look” of my leg by ‘going all the way’. I pull up my knees the best I can, use the inner muscles (instead of the quads because bulky quad muscles will ruin the smoothness of the line). I am told to strengthen my hamstrings and get into the habit of using less quad muscles (I’m still exasperated and figuring out how to isolate the use of my leg muscles). Straightening my legs sufficiently in first position is still difficult for me. (A relative nightmare). In some pictures, with my lengthened and straightened leg, I do look like I have a beautiful ballet leg line. 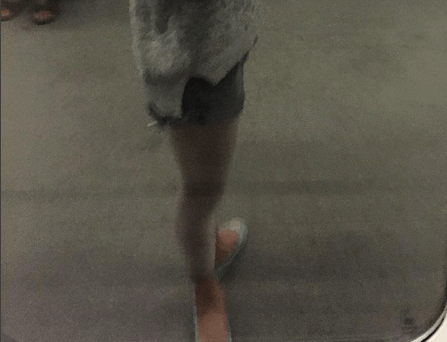 Though my legs are not straight enough in most of my pictures. Nevertheless, in ballet, we are told to make the best use of what we have. I feel this applies to us adult dancers too. We don’t judge our circumstances or age, or ability or flexibility or body. We just come as we are and we get ready to work hard in an honest way. Thus, just one extra tip to think about for your next class. Straighten that back leg (especially in arabesque)!